FOR MANY YEARS Ntsika Ntozini and his family lived in a single storey tin-walled house in the township of Khayelitshia, just outside Cape Town, out of which his mother Vicky ran her own B&B. When Vicky started her business in 1997, the idea of tourists wanting to stay in an area such as Khayelitsha seemed unlikely, impossible even. However she grew her business from the ground up, advertising by word of mouth and in turn created a new dimension to South African tourism. Visiting South Africa now, township guest houses offer tourists a less glossy, unfiltered version of the country and are reasonably accessible. As the business grew so did their home. It expanded into a two-storey house with several comfortable bedrooms which wrap around a small sitting room, framed by several windows with laced blinds. The view from upstairs shows kilometres of rough township terrain stretching in each direction. Ntsika, now 14, remembers the sound of his mother Vicky singing to herself as she prepared the house for the tourists who snubbed Cape Town’s luxurious hotels instead opting to stay in a family home in the outskirts of the city. According to Ntsika his mother was always busy doing something for the business; making sure the bedrooms were clean and tidy, cooking, entertaining guests and showing them around the local area. Ntsika’s sisters, Thandile and Siyamthanda, now 16 and 10, knew their mother differed from other women around her as she was the family breadwinner. They say they are proud that she stood up for equality. Their father, Ntsikana, played a secondary role by collecting guests. Vicky’s business began to generate attention from South African media, with her success benefiting more than just her family. As her B&B began to attract more and more tourists, many brought donations of clothes, books and toys for the community. Her grit and graft also demystified township life for tourists, allowing them to see what went on beyond the boundaries of Khayelitsha. The family’s success story came to an abrupt end in 2012 when Vicky Ntozini was murdered by her husband. Although he never gave a reason for his actions, a family friend said Vicky had spoken of divorcing her husband shortly before her death as, she said, he had become jealous of her. Ntsika and his sisters still live in Khayelitsha in the house where their mother was killed, under the care of a cousin. The house is no longer a B&B. Ntsikana, their father, was imprisoned for his wife’s murder in February last year. Four years on since their mother’s death, Vicky’s children cannot make sense of why their father did what he did. “I always thought he was a good man,” Ntsika said, but as he got older he tried to do things “the old traditional way”. Life in Khayelitsha, one of South Africa’s largest townships, is hard. The majority of inhabitants are unemployed, crime is rampant and the police presence has been criticised as lacking. Despite there being a dedicated Ministry of Women in the ANC government, gender-based violence and sexual assault continue to be part of the blueprint of life for many South African women. 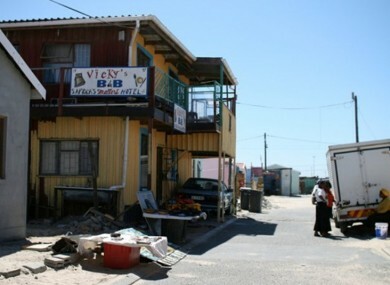 Official figures indicate around 450,000 people live in Khayelitsha, however this figure is often disputed and thought to be closer to one million. Under-resourced and overcrowded, Khayelitsha’s residents live side-by-side in an ever-expanding number of makeshift homes and concrete flats. The UN estimates a woman or child is raped in South Africa every 26 seconds. It also has one of the highest rates of femicide worldwide; three women per day there are murdered by someone they know. In the township of Diepsloot, around 1,422 km away, while Vicky’s story of self-made success is remarkable, sadly how she died is not. “We get an average of 90 women approaching the police station to report domestic violence per month,” said station Commander Koena Moichela, “Jealousy is often a factor in how fights break out,” he adds. “The profile of the type of person who approaches the station to report violence against them is almost always an unemployed female, often from another nearby country,” said Commander Moichela. “Fights don’t tend to break out over women working here as many don’t have jobs, but many men seem to become jealous of their partner’s mobile phone. They’ll want to know who they’re speaking to on WhatsApp and violence will erupt as a result,” he said. Diepsloot is notorious for housing some of South Africa’s most vulnerable: the undocumented. “With cases of non-nationals, many come from small villages in neighbouring African countries where issues in the home are sorted out by a village king or leader. We don’t have that here,” said Commander Moichela. Just as in Khayelitsha, in Diepsloot money is tight and the official population figure of around 140,000 inhabitants does not, many argue, reflect the reality of the sprawling township. More than one third of Diepsloot residents told a study from the Johannesburg that they had no one they could count on if they faced a serious problem or needed help with money, shelter or childcare. One third said they had not been given help during a time of need in the previous year. A South African woman living there with children would be eligible to a welfare grant of around 350 ZAR (€20) per child per month. People from outside of the country living there mostly likely wouldn’t be entitled to anything unless they or their children are disabled. Commander Moichela’s police officers regularly see claims of violence being withdrawn due to a lack of economic independence. “Out of the 90 women who approach us each month, only around 60 will take out a case against the perpetrator,” he said. The resounding issue is clear: how do you help women with no documentation, no money and no resources to free themselves from domestic violence? “We try and spread the message that being violent towards women is wrong by going door to door. We also hand out leaflets and talk to people in public spaces, pubs and shops,” said one community worker. Despite the hardship of poverty, community workers in Diepsloot say they don’t see it as the driving force behind gender violence. Email “Murdered because he was jealous of her success: women at risk in South Africa”. Feedback on “Murdered because he was jealous of her success: women at risk in South Africa”.